Album of 49 photographs. Circa 1850s-1930s. Various processes including salt prints from paper and glass negatives, albumen and gelatin silver prints, and a quantity of watercolours and drawings. Varying sizes from carte-de-visite to 11½ x 9½in. (29.3 x 24 cm.) The majority initialled and titled on the mount, including NSM (3) and JDLL (6). Occasional hand-painted borders with floral designs. Ink manuscript note describing provenance and listing family members, their identifying initials and relationship to Margaret Story Maskelyne, the owner of the album, on the front free endpaper. Green half leather, gilt. 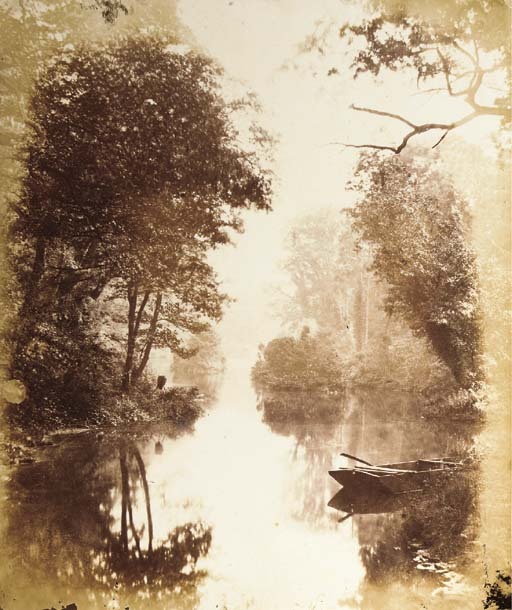 With 6 other photographs, loosely inserted, including an albumen print view of Melbury by Llewelyn and a later print from an 1858 negative of the moon, probably by Nevil Story Maskelyne. A personal album begun by Nevil Story Maskelyne's sister Agnes and continued by his daughter, Margaret. Among several portraits of family members is one of John Dillwyn Llewelyn using a microscope and another of Nevil Story Maskelyne, possibly both self-portraits. Other subjects include the Maskelyne home at Basset Down, Salisbury Cathedral from the river, Purley Hall, Penpont house, Brecon, a few art reproductions, views in Norway including one by Henry Rosling and an Alpine scene by S. Armero. Subjects specifically identified as the work of Maskelyne are three large views titled Charlton, Wilts., Charlton Lord Suffolk's family and The Beech, Basset Down. Those identified as by Llewelyn are a tree study at Penllergare, Penllergare Haymakers, Penllergare (view of the house), The Upper Lake, Penllergare, Study of Ferns and Penllergare School Girls. The watercolours, by various family members, include flower and tree studies, landscapes and beach scenes.